Fran is Female and is 14 years old. Her favourite food is: Fran is not very picky. Her favorite though is the Fiskies Senior, lamb and rice. She is not a fan of any dry food, but adores those temptation treats!! Her funny habits are: Yes! Oddly enough, if I am laughing loudly, Fran gets very upset! So if I am lauging too loud, Fran will kindly let me know by tapping me on the leg or nipping my hand. That makes me laugh even more. Fran was a gift from a friend of mine. I was going through a rough time and Fran came along and saved my spirit. Fran is my best friend. Fran entered my life in 1995, just a week before my dad passed away. When Fran saw me crying, she crawled up onto my lap, then up to my shoulder and nuzzled her head by my neck. Pure love. Fran has always been like my 'gargoyle'. She dislikes EVERYONE but me!! She sleeps around my head at night, and is always perched very close to me no matter what I do. My protector. My lady Fran just turned 14 on November 19th 2008. She still runs up and down the hall like a kitten at times; she is my best buddy of all time and I love her like crazy. Fran the cat Respect the queen!! I think every cat is beautiful especially to their own owners. yes Fran is gorgeous i love her markings. She looks so relaxed too sitting there resting on that chair arm. Ah the life of a domesticated cat. (PA)My baby Fran died on April 19th 2010. She would have been 16 this November. It happened so fast...she had stopped eating. That was so unusal, since she loved her food. I got her to the vet, he did tests, her liver was failing. He put her on a regimen of pills; she was a little better for a few days, then began to decline again. As the days passed, I tried everything to make her as comfortable as possible. She was at the just about every other day...and then on April 17th she began hiding. I know what they say, once a cat starts to hide, they kind of want to be left alone in their pain. And I knew that for her to not come out for me, something was seriously wrong. I called the vet, and I had Fran put to sleep on the morning of April 19th. I am still devastated over the loss of her. Days pass, and I wonder if I did the right thing by putting her down...but then I think of the constant vet visits that she dreaded, and I pray that I did the right thing, I hope she is at peace. No one ever tells you how difficult it is to lose a pet, a best buddy. I think I miss her more than some people that have died. That may sound silly, but its true. I pray my Fran is at peace. I pray she knows what I did I did out of love and to not see her suffer anymore. I miss my best friend. I am so sorry to hear of your loss. I absolutely agree with you, the pain of loosing a pet is one of the worst things I have gone through myself. I too had to put down our beloved cat last year. It is never a easy decision and you always question whether or not you are doing the right thing. Believe me it is the kindest and best gift you can give your cat, a pain free passing. I truly believe they know that you did it for them from love. God bless and I hope that one day you find another friend o love you and be loved. I know your pain over and over many times. I lost 5 of my dear rescues who had become family members in just the last 12 months. Old age and cancer claimed them all but losing 5 in one year is devastating. LOSING ONE IS DEVASTATING in its self. 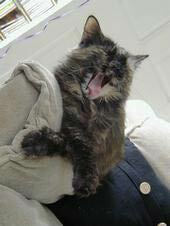 I lost my Snickers in Feb. 2010 to liver and kidney failure (due to old age). She was almost 14. She too loved to eat and was very active until 3 or 4 days before I had to have her put down. She did like your cat and started to hide the last 24 hours. I chose to have her put down to take away her suffering. I questioned my decision for weeks after and I still cry and wrangle with my decision but I assure you that helping them cross over out of pain is the RIGHT decision. Your cat needed your help and you did the right thing to take her suffering away. So , from one cat lover to another, please know you did what was right and should not question your decision. I know your pain and the loss is GREAT and time is not our friend in this loss as the pain remains a very long time but your cat is no longer suffering and that should bring you some peace. Bless you in the good home and life that you gave your best friend. You will be rewarded for your love given to your cat in her lifetime.